This episode of the Maitripa College Podcast, “A Talk about Karma”, features a teaching from Yangsi Rinpoche, Geshe Lharampa and President of Maitripa College. In our inaugural Podcast, Rinpoche gives a concise and inspiring explanation of the Buddhist view of karma. In clear, accessible language, Rinpoche gives advice on how to correctly apply this understanding and how to develop mindfulness of body, speech, and mind in our daily lives. Yangsi Rinpoche was recognized as the reincarnation of Geshe Ngawang Gendun, a renowned scholar and practitioner from Western Tibet, at the age of six. Rinpoche trained in the traditional monastic system for over 25 years, and practiced as a monk until the age of 35. In 1995 he graduated with the highest degree of Geshe Lharampa from Sera Je Monastery in South India. 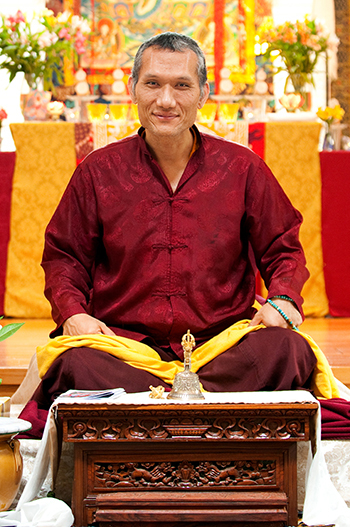 He then completed his studies at Gyume Tantric College, and, in 1998, having the particular wish to benefit Western students of the Buddhadharma, Rinpoche came to the West to teach and travel extensively throughout America and Europe.